This review is a long time coming—for many reasons. I met Lori Budd, co-owner of Dracaena Wines about three years ago. She’s a fellow blogger, a major social media presence, and, as it turns out when I finally met her in real life during the 2017 Bloggers Conference, one of the nicest people. 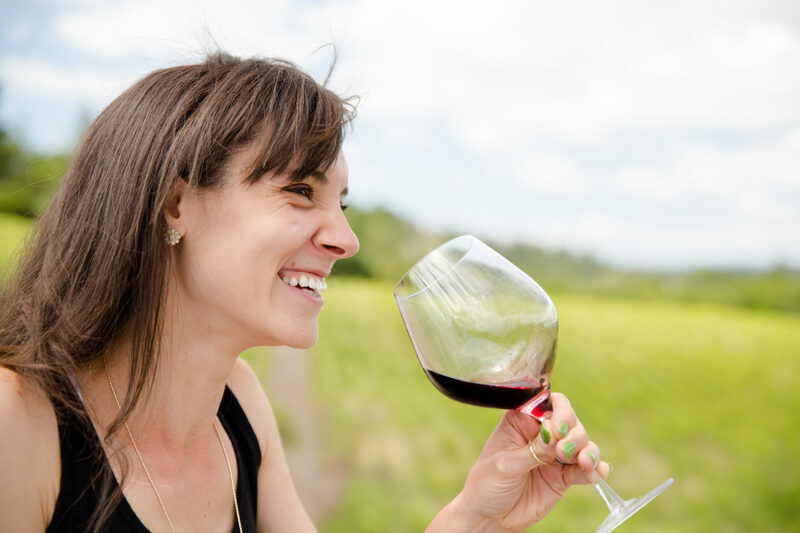 One of their brand’s “tag-lines” if you will is “Pursue Your Passion.” It’s a regular feature on their blog, highlighting folks in the wine business that have made great strides to create a space for themselves in the wine industry. And I think that feature is completely appropriate since that is what Lori and her husband, winemaker of Dracaena Wines, did in creating this brand. Their focus is Cab Franc (please don’t forget to celebrate #CabFrancDay this December! ), but in 2017 joined the rosé craze with Syrah straight from California’s most well-know Rhone regions, Paso Robles. Lori was kind enough to send me a bottle and it took some time before I was able to taste it (I wanted to be sure to share this special bottle with my special someone) and, I’m sorry Lori, even longer to get my review up. So cheers to friendship and fine wine! This one is for you Lori! About the Wine: The Dracaena Wines 2017 Rosé of Syrah is made of 100% Syrah grapes harvested from the Mossfire Ranch Vineyard in Paso Robles, California. After harvest, crushed grapes went directly to press. Juice was fined gently as it cold-settled in tank. It was then racked to stainless steel and fermented at about 58°F to 62°F. Flavor Profile: Open the bottle of the Dracaena Wines 2017 Rosé of Syrah and breathe in late summer aromas of stoned fruits like peaches and nectarines, the almost dull, watery freshness of watermelon, and a whisper of a warm wind. On the pour, this rosé is near clear with an amber hue, but settles into the glass the burnt-orange-meets pink of an August sunset. And as it flows from bottle to glass, this wine already emits a beautiful aroma. Initial aromas are of those stone fruits, but add to it a bit of grassy-green herbs as well, like parsley or coriander, a hint of white chocolate, and an overlying floral aroma. Swirl and enliven those fruit notes just a bit more and add a touch of fresh wild strawberries. The palate of the Dracaena Wines 2017 Rosé of Syrah is crisp, textural, full, and—I literally wrote—delicious. There’s a solid acidic line here that works to uplift every flavor: strawberry, passion fruit, macadamia nut or marcona almonds, and a lingering finish of white pepper and an after-breath filled with those wild, somewhat brambly strawberries. Note, this is a dry rosé—the texture is more dominant than expected and pleasantly so. Food Pairing: I paired the Dracaena Wines 2017 Rosé of Syrah with a homemade pizza. Mine was topped with various veggies, mozzarella cheese, and tomato sauce. And, yes, it was a wonderful pairing. The toastiness of the crust uplifted the dry textural components, while the strong acidity in the wine cut through the fats and oils of the pizza itself. But who are we kidding it was wine and pizza—a good wine and pizza. So very little notes were taken, but much eating and drinking were done. More Info: I received the Dracaena Wines 2017 Rosé of Syrah as a sample for review. (Cheers Lori and Mike!) Price: $20. For more information about Dracaena Wines, their wines, and to purchase wine directly, please visit the Dracaena Wines website.